By A.G. SulzbergerThough that commitment has been much romanticized, it has also been the focus of persistent criticism, most vocally from American Indians, who have long regarded the project with a mix of support and suspicion. 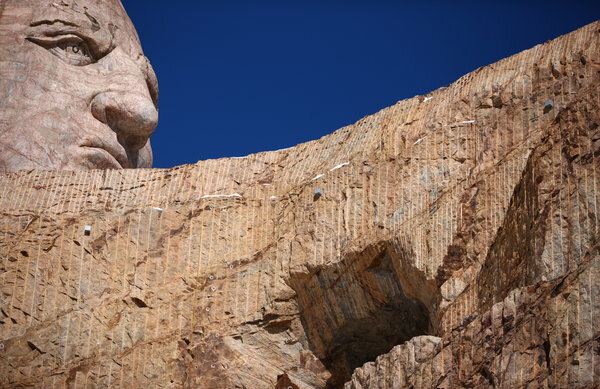 Many complain that the family has made millions of dollars from a project that, while carrying the name and imagined likeness of Crazy Horse, has become more of a monument to the sculptor than to his subject. Indeed, the bearded, mountain-man profile of Mr. Ziolkowski, who is buried on the grounds, is as ubiquitous as the stern visage of the Sioux leader around the visitor complex. And the 85 full-time staff members at the Crazy Horse Memorial Foundation included more of his descendants (seven) than Indians (five), even though the nearby reservations have some of the highest unemployment rates in the nation. Thomas Shortbull, president of Oglala Lakota College, which receives a number of scholarships from the foundation, acknowledged the discontent. “But most people see the positive of filling the void of the lack of recognition that we have in this country for Indian people,” he added.Comment: The points in this article apply to other "honors" as well: everything from Indian mascots to Hollywood tributes to apologies for past injustices. The gestures are nice but meaningless without accompanying action. Indians want substantive change, not happy talk. For more on the Crazy Horse Memorial, see 21st Native Americans' Day at Crazy Horse and Crazy Horse/USD Academic Partnership.